More fantastic music continues to come out of Canada. Chris Page’s new release, Volume Vs. Voice, immediately, upon its first track, announces itself as one of the best discs of the year. This music has a wonderful folk sound, but with something of a punk attitude and rock influence. 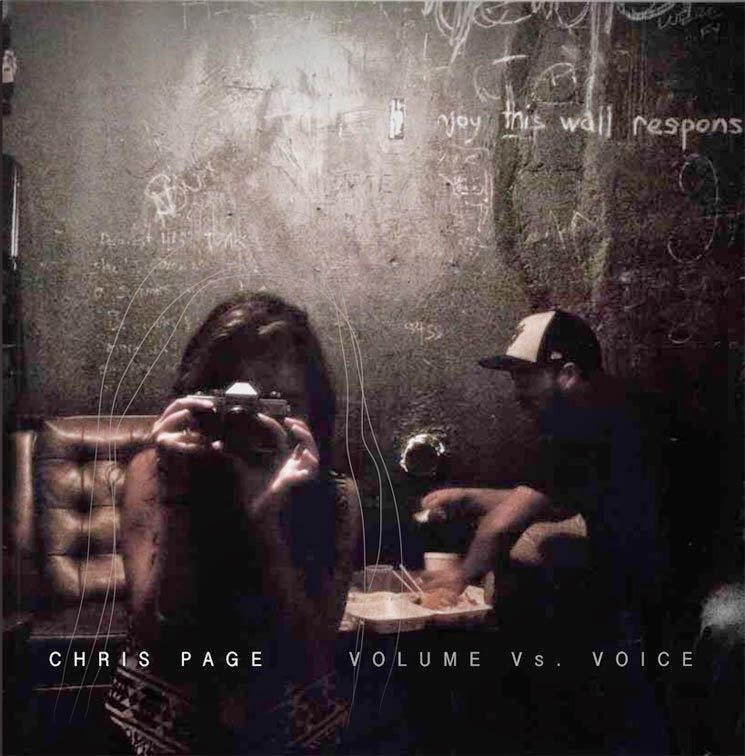 Chris Page is known for fronting bands like Camp Radio and The Stand GT, as well as for his solo releases, and on this CD he offers an excellent new batch of original tunes. This really is a solo effort, as Chris is unaccompanied on many of these tracks, performing the vocals and playing all the instruments himself. Lyrically, this is a seriously strong album. Check out these lines from “Chaise Lounge,” for example: “Speak to the kid, tell him that there’s merit in being wasted/And it was bad what we did/Gave up on a dream before we chased it/And I’ve got false hope now/And I should show you how/To hide your smile/Before it’s broken.” Excellent, right? The entire album is like that. The album opens with “Rocket + Savings,” which begins sweetly with a nice bit of guitar. What I love about it is that it could lead in almost any direction (to a country song, or bluegrass, or rock or whatever), and it would work. And after a few seconds you just begin enjoying it for itself, without thinking about where it’s going. But it also ends up serving perfectly as an intro for this acoustic-based moody rock tune. This song has a great sound, but I think it’s its unusual lyrics which I most appreciate. “When I buy a rocket with my own savings/Take it to the river the first sign of spring/Shoot it for the stars and hang out where the space junk flies.” And I really like this line: “Thank our lucky stars until our engines rust.” There is some gorgeous work during the short instrumental section. John Higney plays pedal steel and slide guitar on this track. “Calling All Kids Reunion” likewise boasts some interesting lyrics. Here are the opening lines: “Keep your antenna up/With any luck, we’ll kill off this farewell/One ticket for the train/Enduring pain and one room cheap hotels.” The song then comes back to the first two lines at the end. It’s a really good song, but it is the following track, “Hunker Down,” that is one of my absolute favorites. It’s undeniably beautiful, with some loving lines that are anything but cheesy – lines like “You looked rather smashing/When you leaned in to kiss my cheek” and “And I ache to have you closer.” The mood of this one grabs me and holds me. It’s a song I've listened to over and over. Another track that really stood out the first time through, and which continues to be a favorite of mine, is “Treatment Burns.” I love the way it establishes a dark mood with the instrumental opening before Chris adds his vocals, like an aging yet still ominous pulse. “The city’s claimed our hands/To guide us as the light dies.” This is a song that gets on top of you and is reluctant to release you. It’s followed by “My Focal Point,” which provides this album with its title in the lines, “Lend me power tubes/And let me work this through/Volume versus voice.” Bandeeto Colin and Morgan provide backing vocals on this track. “Disappointed A Few People” has my favorite song title of this album, and it features John Higney on pedal steel and slide guitar. The album then concludes with “Time To Dispel.” Like the album's first track, this one has a nice instrumental introduction. Volume Vs. Voice was released on CD through Melting Plastic on April 21, 2015. There are also a limited number of copies available on vinyl.